I had fun with some of these a few years ago, so I thought I’d make a return to them. The internet is a great source for finding wild claims about evolution that range from the deeply confused to the brazenly dishonest. Twitter is an especially useful source. Here’s a wonderful example from twitter. @DebunkEvolution: #Evolution has never been observed. Darwinists can’t get away from this fact. I like that this guy can’t even say evolutionary biologists, and has to spit out ‘Darwinists’ instead. The typical starting point to these claims is inventing a different definition of evolution. For a biologist, evolution is the change in frequency of inheritable traits (or alleles) in a population over time. The mechanisms of evolution include mutation combined with selection, genetic drift and some other uncommon processes (e.g. endosymbiosis). For a lot of creationists, evolution seems to be redefined as ‘a monkey gives birth to a human-baby‘. So, by the scientific definition of evolution, we see at all the time. Modern crops or livestock, household pets, are all the products of evolution. Pesticide resistance in insects is another pesky example of it. Wild examples include beak-size in the Galapagos finches , where the work of Peter and Rosemary Grant tracked responses to environmental variation. There are a plethora of studies on model organisms (yeasts, bacteria) that demonstrate evolution occurs. What about in terms of seeing a new species evolve or a new biological structure? In general, we don’t think evolutionary processes will act fast enough with our short-life spans to observe such events. That’s not really a crucial problem. Molecular biology has given us a way to observe evolution. It’s called DNA. The merit of genes (and other inheritable molecules) is that they get preserved in high numbers, leaving a record of evolution in every organism. But we also have rare example s where evolution has occurred fast enough to observe marked changes. 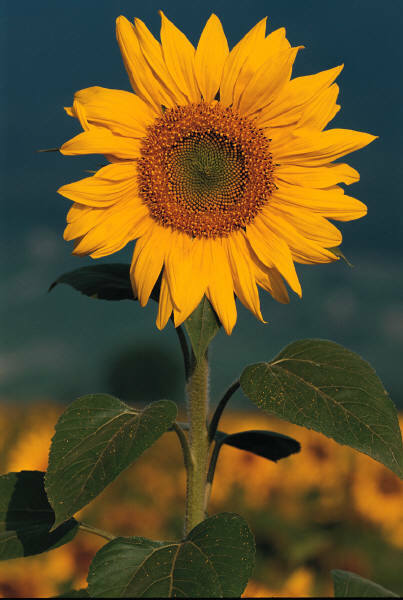 One of these is with the sunflower Helianthus anomalus. An analysis of its genes concluded it speciated by hybridisation . Two related sunflower species yielded a hybrid that was an entire new species. This was then tested with a lab experiment and the speciation-event was replicated. There is no such thing as a ‘species barrier’ that prevents new species from forming. At a structural level, the Italian wall lizard (Podarcsis sicula) that was shifted to the island Pod Mrcaru showed some remarkable adaptations . The increased dependence on vegetation for food prompted the evolution of new gut structures- caecal valves. These form chambers within the gut where food moves more slowly. This permits the fermentation of plant matter for digestion. This new structure is entirely novel to this lizard species. Evolution is a fact. It takes a peculiar level of intellectual dishonesty to deny it. P. R. Grant and B. R . Grant. 1995. Predicting microevolutionary responses to directional selection on heritable variation. Evolution 49: 241-251. There are a few* long-term experiments tracking evolution in small organisms like yeast, where the generation time is small and large populations are involved. Grant, the best example of “tracking evolution in small organisms” is surely the work by the Lenski lab on E. coli. It has been running since 1988 and has had some remarkable results. The most famous of course is the evolution of the ability to metabolize citrate aerobically. The experiments are so elegant because at 500 generations (to date they have run over 50 000 generations) they remove and freeze cells to take a snapshot in time. Using these saved generations they could rerun the “citrate evolution” to determine when it arose. Whichever is “better”, there are certainly studies observing evolution “as it happens”. Lenski’s work with E.coli is definitely the most well known example using model organisms and one of the most ambitious. But there is of course, a plethora of studies using bacteria and yeasts, tracking the evolution down to the level of actual genes. The point though as Grant reminds us at the end, is that evolution is observable at the time scales we live. We can show it happening at the level of genes (model organisms as above), at the level of speciations (various polyploid plant hybrids) and vertebrate morphology (birds, lizards). That’s before we even look at the other lines of evidence demonstrating evolution over long time periods.